I just watched this for the first time, and I have to say, I liked it. Here is one way to look at it. 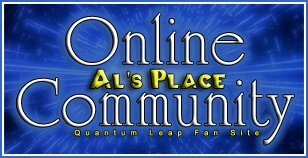 We all know that the future for Quantum Leap was 1999, which is now long since our past. I look at Source Code as possibly being an Alternate reality. What if, when Sam was lost in the timeline, the Goverment comes in and Militarizes the Project. They would have 11 years to fix the project so they could send a leaper wherever and whenever they want. Then, choose a new Leaper with nothing to lose and you have Source Code, complete with a Scott Bakula "Oh Boy" during a phone conversation. Just a thought. But I have to say, it was enough like Quantum Leap to hold me over for a while. Finally saw this on DVD tonight. Great movie! I picked Scott Bakula's voice out right away over the phone call. Reminded me so much of the Pilot episode where Sam calls his Dad. Except this time, Scott is the Dad. Now, why is Quantum Leap not on the big screen? If we can get the Smurfs going to New York, surely QL deserves a shot. I still haven't gotten a chance to see this, but until I read this thread I thought this was just another time-travel movie, somewhat similar to Déjà Vu, but had no idea it used QL's plot device. But if Scott's cool with it, so am I. Another interesting little QL connection is that director Duncan Jones' father, David Bowie, used to have the stage name Ziggy Stardust. Well, oddly enough, this just showed up in the mail through Netflix the other day so I finally got a chance to watch it. I thought it was a good movie and definitely an unconventional take on the typical time-travel film. I love that it acknowledged the "parallel timeline/universe" theory that counteracts paradoxes. However, I thought I understood it until the end, where I was left a bit confused. It's without a doubt a mix of Quantum Leap, Déjà Vu, and I'd say even a little bit of Groundhog Day. And of course I recognized Scott Bakula's part and the "oh, boy" line which I couldn't help but go, "there's Scott!!" I think someone wants to point out similarities to QL!!! Wait, they're making Source Code into a TV series? Why am I only reading about this a year and a half later? Have any episodes been shown yet? I seem to be the last dude on the planet to see this, and massive QL fan thought I consider myself to be, I'm ashamed to say that while I kept looking for Scott and telling my wife "This is totally Quantum Leap" I did not recognise Scott's voice on the phone. However the whole story with the dad and the phonecall to him were lifted straight from the (correct me someone) second episode or the end of Pilot, and I loved the "Oh Boy" line so much I nearly peed my pants. All that was missing was the "not my face in the mirrir" sound effect (you know you can hear it right now in your head). I wondered if it would have killed them to have the "Goodwin" character played by, say, a charismatic older chap with a penchant for cigars and loud shirts? However, if there are any Dr Who fans out there, I wondered if you felt Dr Who's introduction of Clara "Osgood Oswin" was perhaps a bltant rip off of this earlier work (Source code, not QL). When I saw the souffle girl episode I loved it, thought it was original and excellent but now I have a bad taste in my mouth to think they just pinched it from the "capsule" scenes in SourceCode. Last word on SourceCode (which again, I really very much enjoyed) was that the whole "who is the bomber" thing was incredibly obvious to anyone with half a brain or who ever saw a time travel story before" which slightly killed the suspense, in my opinion, anyway. Nope, you're not the last. I've had it on dvd in my collection for absolutely ages but I'm ashamed to say I still haven't gotten around to watching it. Must confess from all I've heard I have some misgivings about watching it and being disappointed. I loved the soufflé girl ep too.